⏩Add the coconut cream and mangoes to a blend and pulse until well combined. Set it aside. ⏩Put some oil into a pan and add in the onion, garlic, and ginger. Saute until fragrant. ⏩Add the curry powder, turmeric, salt, and pepper. Stir until the spices activate. ⏩Pour some oil into a pan over medium-high heat. Put the chicken breast in and fry until brown. ⏩Put the water, mango, and coconut sauce in, stir, and bring to a boil. ⏩Allow simmering over medium heat for 15 minutes. ⏩Garnish with cilantro and serve over a bed of rice. 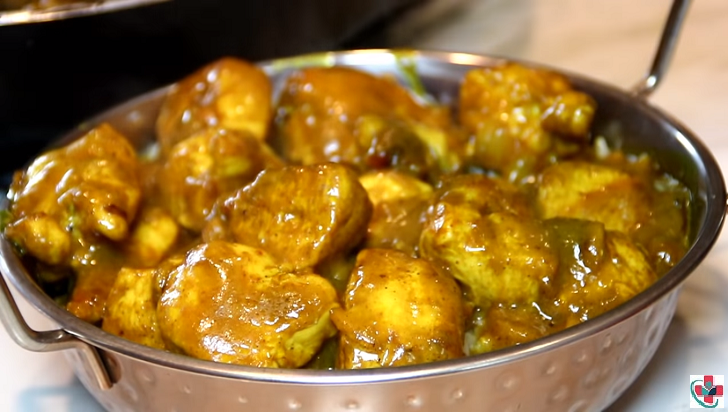 ⏩Enjoy your mango chicken curry in 30 minutes.